Saving your own seeds can be scary, especially to a gardener who hasn’t done this before, or for long. So many questions come to mind: “How,” “What,” and “What if,”…. These are put to rest with good information, some trial, and, of course, some error. 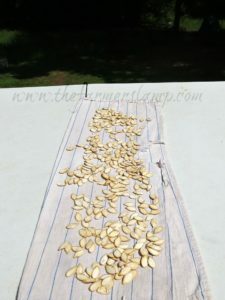 Don’t worry, I’m going to share with you just how to save seeds from your garden harvest. To the old-timers, saving seed wasn’t an option, it was what you did so you could plant your garden next year. As the boomers fled the farm and country life, a whole generation lost this knowledge, and much more. Many are having to relearn it. Here on Fairhaven Farm, we save most of our own seed. I am still learning about saving little seeds like lettuce and carrot. We’ll take a look at some of the seeds we save here at Fairhaven Farm. Every year we add at least one new plant that is a rare or unusual variety to the farm. 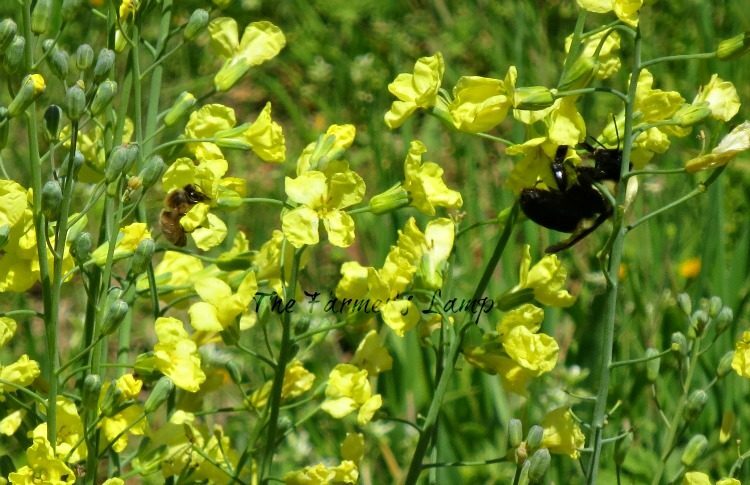 We buy these seeds and any other seeds we might need from Baker Creek Heirloom Seeds. We buy from Baker Creek because we are non-gmo, organic farmers (learn more about this). We support their efforts and we get quality, non-gmo seeds. These two are some of the easiest seeds to save. Once our peas/beans are up and blooming, we pick the healthiest row to be our seed row. We don’t pick this row at all. Our rows are almost 50′ long, so one row provides all the seed we need. I plant my beans in half-rows on the square. I save the healthiest of these half rows as our seed row. We plant 4 varieties of beans. Your peas/beans are bearing and you’ve decided which rows are your seed rows. Now, just leave them alone. Let them dry in the field. Watch them to be sure they don’t turn moldy or otherwise suffer from the elements. Seed pods will mold when exposed to excessive moisture with no sun to dry them. When they are good and dry, pick ’em. We store ours in a burlap bag and hang it from the rafters in the feed shed. I have an old axe handle that I beat the bag with several times a week when I go in for feed. We do it this way because this is how my grandmother told me they always did it and this way has proven to work great for us. We plant peas twice a year, spring and fall. We plant the fall crop for soil nutrition, but we reap the benefit in extra peas also. When it’s getting close to spring planting, we take the bag down and winnow the seeds from the shells. Because we’ve beat the bag over the winter, winnowing takes minimal effort. Now, you’re ready for planting! 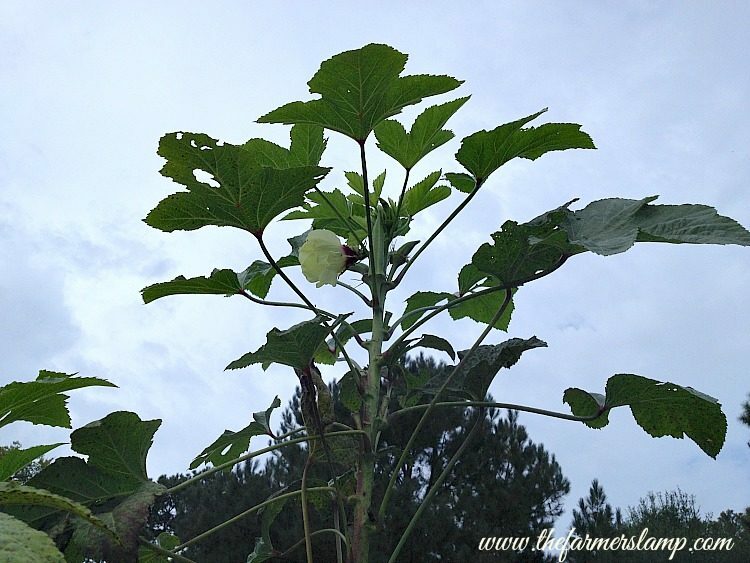 Okra is another easy plant to get seed from. Just like with the peas and beans, once the plants are up and blooming, we pick the three largest, healthiest plants for seeds. We tie a brightly colored piece of string, tape, rope, or some such around the bush so it doesn’t get picked. As pods dry and turn brown on the stalk, we cut them and bring them inside to dry a little more. We are in gardening zone 8 so by late September early October we’ve harvested all the seed pods. After they’ve dried inside for a week or so, just shuck the pods and remove the seeds. Store them in a cool dry place. In the past, we put ours in freezer bags and put them in a box in the freezer. Now we store them in glass jars with tight fitting lids and keep them in our storage room. Our storage room is an unheated room in our home. We are moving away from depending on the freezer due to the failing electric grid in America. Storing seeds this way is just one step we are taking to be more self-sustaining. You say, “I don’t raise gourds.” Neither do I, but squash, melons, and cucumbers are a part of this family. All these seeds are saved basically the same way. Choose the healthiest plant and the hardiest fruit on that plant for seed. Let the ones you choose for seed develop on the vine until they are mature. Like a gourd, they will turn yellow or brown, depending on the plant, and the stem will be dry. These are signs to tell you the seeds are ready. The seeds attach to the fruit by the pulp (that slimy stuff). Using a spoon, scoop out the seeds, pulp and all. I put mine into a quart or half-gallon jar so that they’ll have some separation room. Add enough water so there is some floating room and cover the top with a rag or towel. Let sit at room temperature for 2-4 days. Be sure to stir them twice a day to allow seeds to separate from the pulp. Don’t skip this fermentation process. It’s vital to destroying seed borne diseases and in removing the pulp covering from the seed. The seeds that are viable will sink to the bottom. At the end of the process, the seeds floating on top are not fertile. Scoop the pulp and dead seeds from the top of the jar. Now set them out to dry. Be sure they are not layered. It’s best to let them sit for at least 2 days. I put mine in the sunshine. If your climate is cooler or you experience rain, you can dry them in a dehydrator on the lowest setting. Be sure to not go above 118 degrees F. Any temperature higher that that will kill the live enzymes in your seeds. I’ve done this and it works fine. Tomato seeds are saved pretty much this same way. Let the fruit you choose for seed stay on the vine way past ripe. We pick three from each variety we grow. It’s better to have more seeds than you need rather than not enough. To remove the seeds, cut the tomatoes open and squeeze the seeds into a glass container. 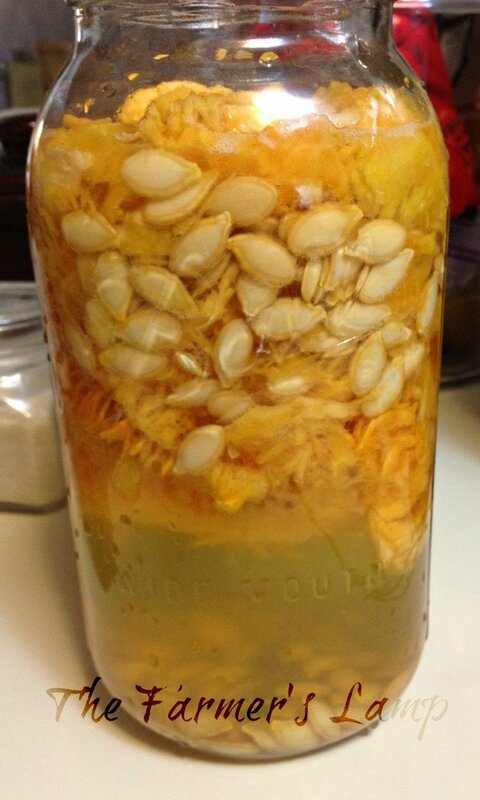 Follow the same fermentation steps as you did for the gourd family. Dry the tomato seeds the same way also. It’s a little harder to be sure they aren’t layered, but the extra time is worth the reward. Peppers of all varieties are easy to save seed from. Leave the hardiest, healthiest fruit on the plant until past ripened, maybe even to the point of shriveling. Cut the pepper in half and remove the seeds. 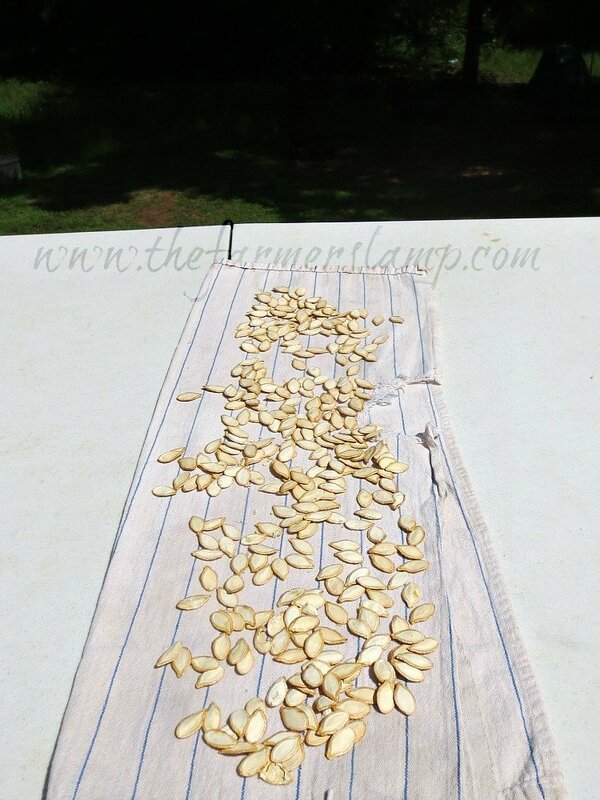 Allow them to thoroughly dry for 2-3 days in a warm, dry place and then store in a cool, dry place. I like to lay them in the sun. If I can’t, I use the dehydrator being sure to not heat above 118 degrees F for the reasons we discussed in the gourd section. If you are saving seeds from hot peppers, don’t make the same mistake I did! Please use disposable gloves. Many, many moons ago, when I saved hot seeds for the first time, I burnt my hands and face by not wearing gloves! If you should get any of the oils in your eyes or on your face, wash with milk or, even better, with yogurt. These will cut the burn almost immediately. Broccoli, Brussel Sprouts, Cabbages, Cauliflower and a few others. These may seem more difficult to save seeds from, but they aren’t. Choose your healthiest plant and let it go to seed. I harvest the center heads of my Broccoli and leave the side shoots to go to seed. As the plant matures, it will send out shoots which will flower. Bees love these and will pollinate them for you. Members of this family which are planted in fall will produce seeds in spring. 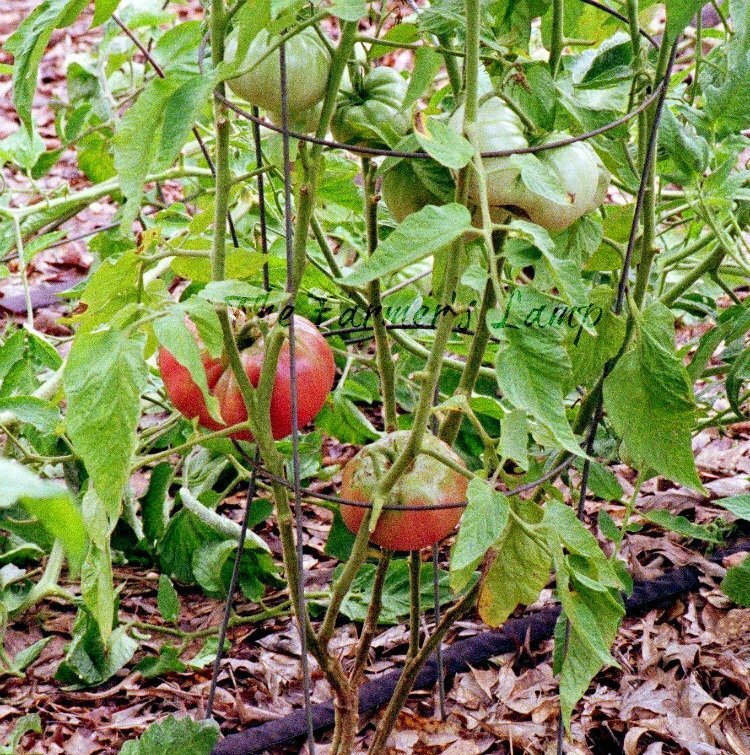 Spring plantings will produce seeds the following spring. From the flowers, seed pods will develop. 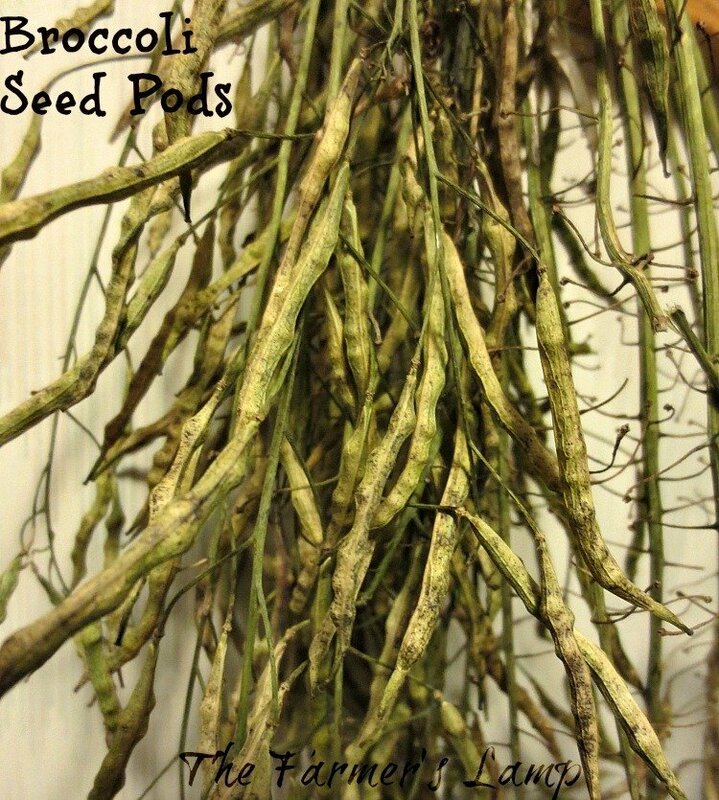 Once these pods have dried in the garden, bring them in and allow them a week or so in a dry place to continue drying. When they’re ready, shell the seeds from the pods and store them in an airtight glass container or seed saving envelope. This is a beginning guide. There’s so much more we could share about seed saving. Don’t be afraid, just do it. Move past your uncertainty and own the responsibility for your seeds. We gain the freedom and peace of mind of knowing what we are planting, where it came from, and how it was grown. So just dive in and get started. Remember, I’m here to help you in any way I can. Use the Contact Me page to reach me. You can also connect with us on our social media sites and contact me that way.